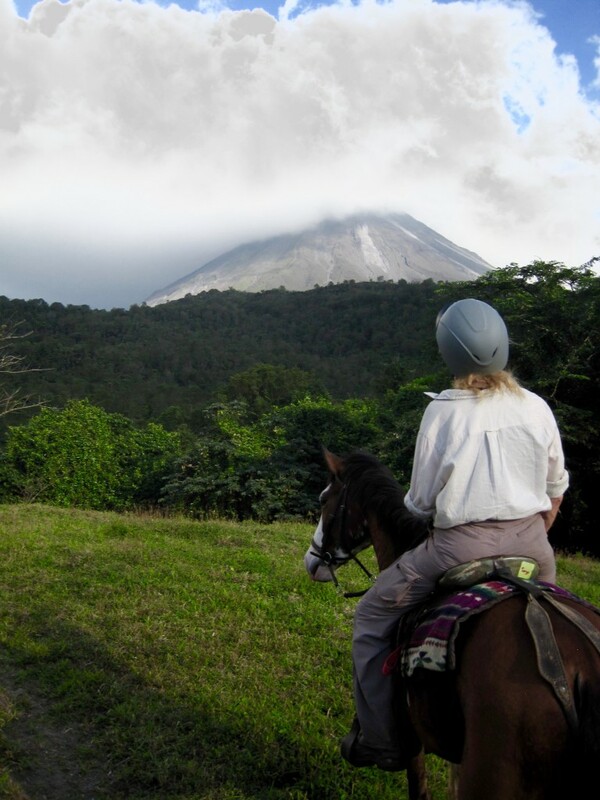 It’s the day I’ve been waiting for, the “off property” day when we can choose from a list of several activities for the morning, then a ride around the Arenal Volcano on our horses in the afternoon. No yoga this morning due to an 8am departure. Our choices for the morning activity are Hanging Bridges/Nature Walk, Ziplining, Canyoning or Volunteer at the Wildlife Rescue Center. It’s probably not hard to guess which one I pick. Yes, the wildlife center. 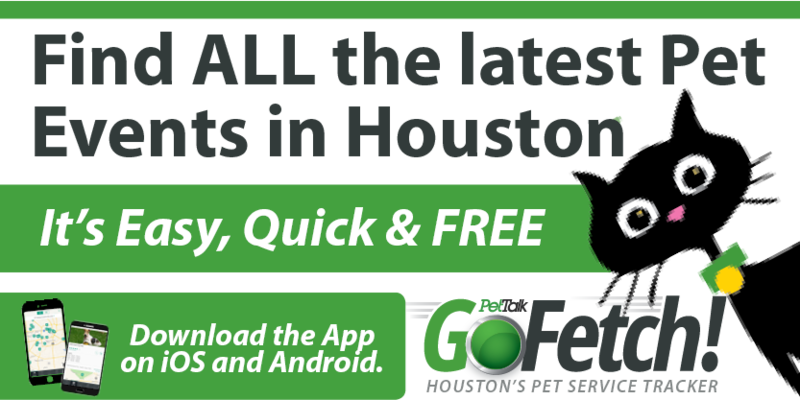 I can’t wait to see the critters they have – totally different from the wildlife at home. But, it wasn’t meant to be. The Wildlife Rescue Center was full for the day so I had to pick between the other three options. After the terror of the night ride, I really didn’t want anything thrill-seeking. I just wanted to walk on my own feet. “You signed up for an adventure vacation” says one of my fellow adventurers. Right. I appreciate their version of sarcasm. I contemplate the options of walking across dangling bridges that may or may not be in disrepair, flying 200 feet above the rain forest canopy attached only by a wire, or repelling down rock walls into a river gorge – hmmmm. Hard choice. “Can I just stay home?” I ask. “You can but you’ll miss the volcano ride,” says Debbie. Crap. I don’t want to miss the highlight of the entire trip so I realize I have to pick one. I look unsure as I think this through. 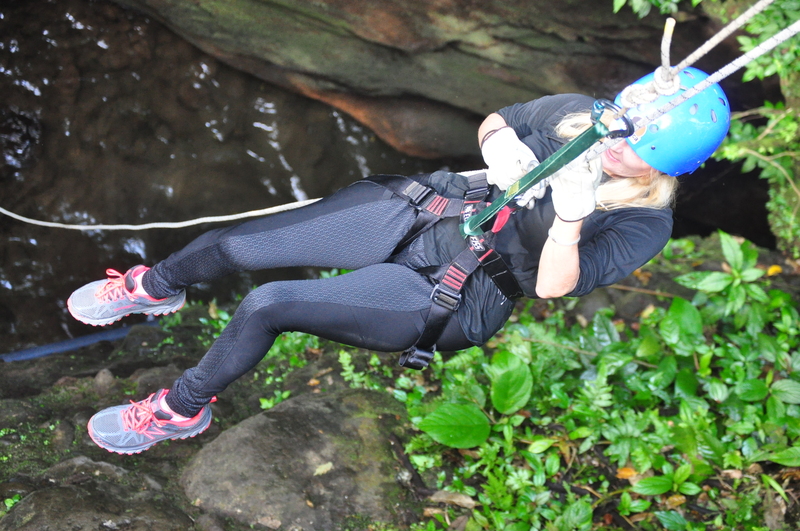 “You’re going Canyoning,” Debbie says without hesitation. Ok, I guess it’s better to just be told what to do rather than waffling. Decision made, we get instructions on what to bring. 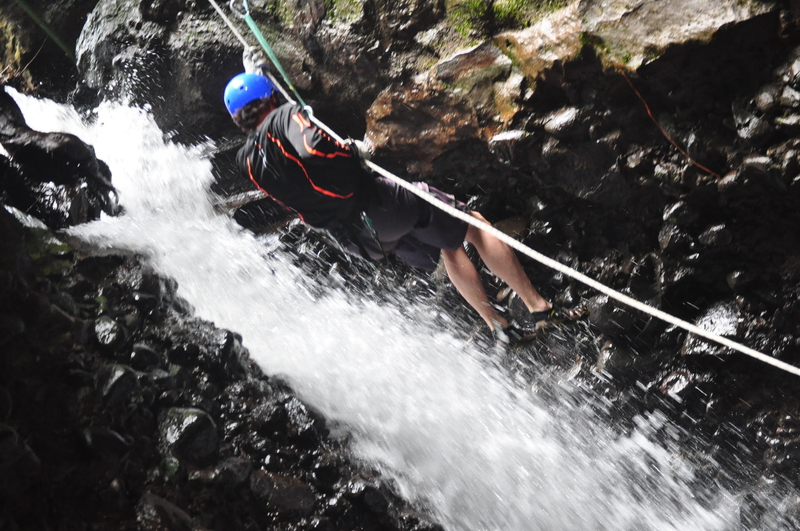 “Be sure to wear something that you are ok with getting wet.” I thought I was repelling down canyon/gorge walls. Hopefully only once. “Including your head.” What??? Am I going to fall head first into the river below? I feel fear creeping up…more adventure. 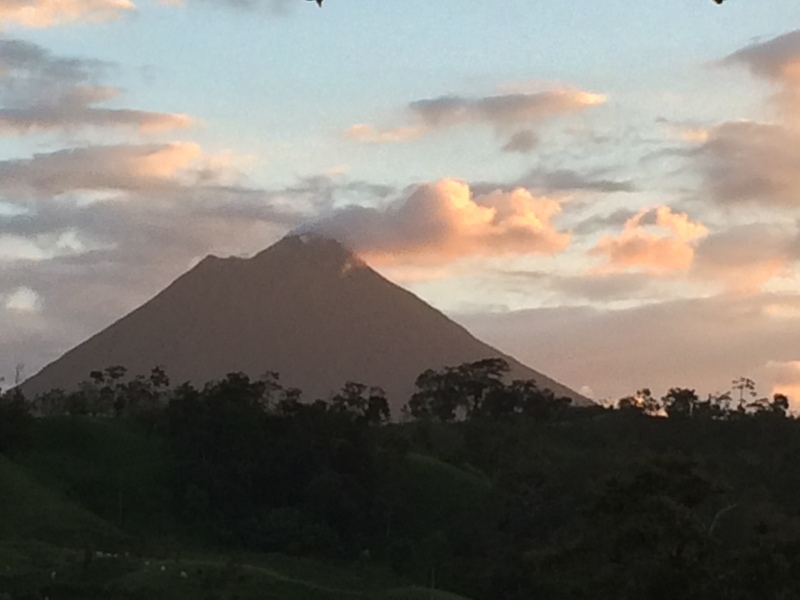 We climb in the cars and head toward the Arenal Volcano, the main attraction for tourists in this area of Costa Rica (North Central). 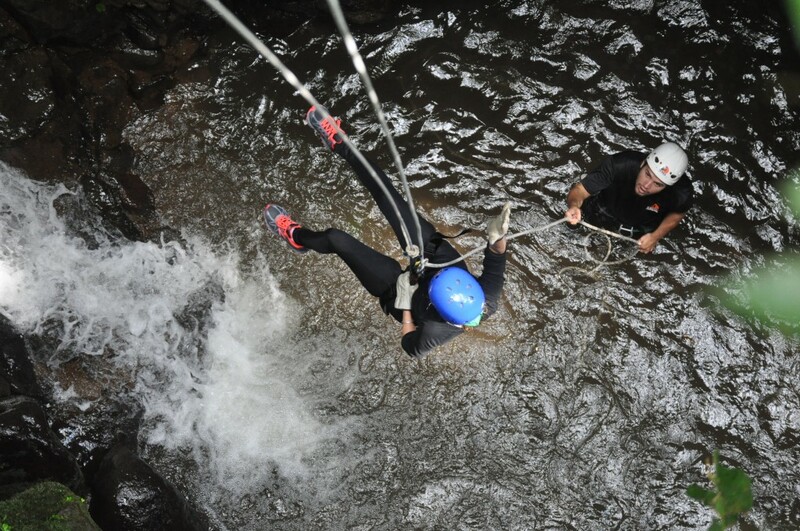 A few have decided to go to the Hanging Bridges, a few to the Zipline course and 8 of us are going “canyoning.” We have no idea what we are in for. Only Debbie has done this before and I’m proud to say I’m not the only one who would prefer to have stayed stationary and not test our “vulnerability” once again. 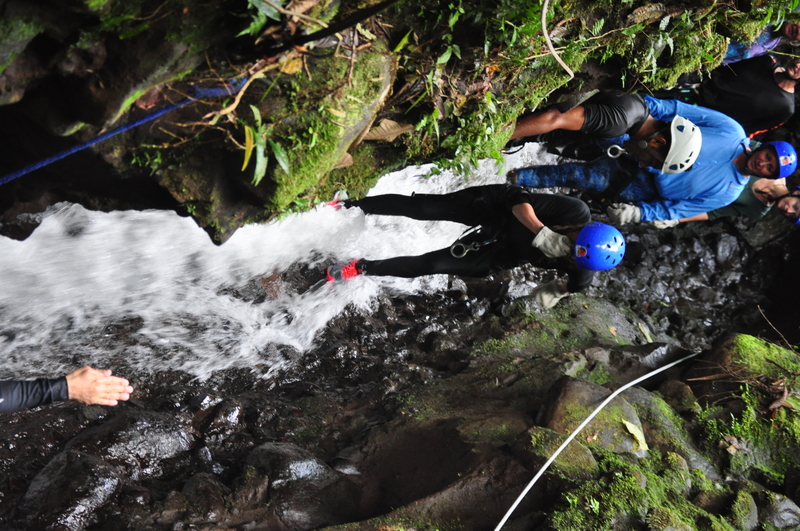 We arrive and our guides give us a quick safety course as they hook a harness with multiple carabiners to our waists. They show us how to ease off the platform backwards to begin repelling face forward to the rocks plus how to go faster, slower, brake. He also tells us not to touch anything in the flora/fauna because last week someone touched a fer de lance (super big snake) not knowing what it was. I get to face two of my biggest fears all in one adventure, heights and 8ft snakes. I’m thinking a swinging bridge looks pretty good right now. We head down a steep path to a wooden platform that is only strong enough to hold 6 of us so the others hang back. I’m third in line. I peak over the side of the platform. Below me, about 30 ft. down, is a narrow, rocky canyon filled with plants, rocks, water, mold, and the guide who has repelled down to be the other end of the rope. I’m definitely scared but not as scared as riding a horse through a treacherous trail in the dark. The trail was about trusting the horse; the repelling is about rusting the guides and the ropes. I bend my knees, swing off the platform and dangle in the air – for a photo of all things! 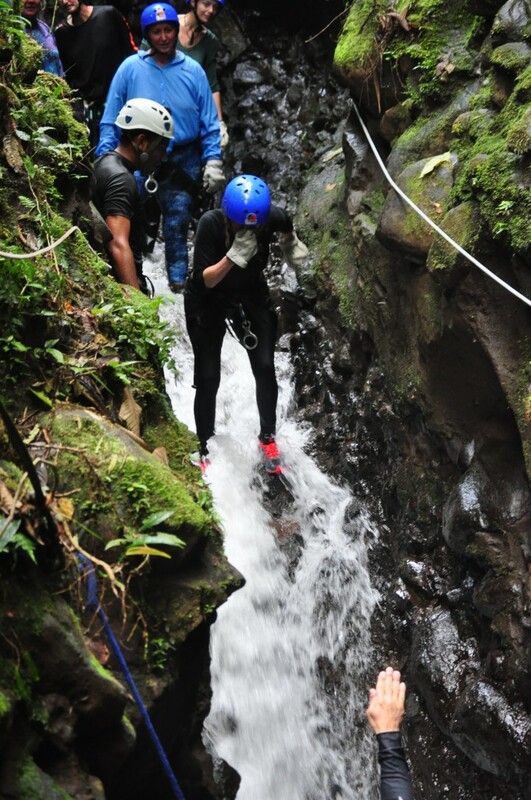 I make my way to the bottom, relieved to touch down but the water is COLD and flowing and the rocks are slippery. I find a spot to wait for the others. Everyone makes it down after much cheering and cajoling. 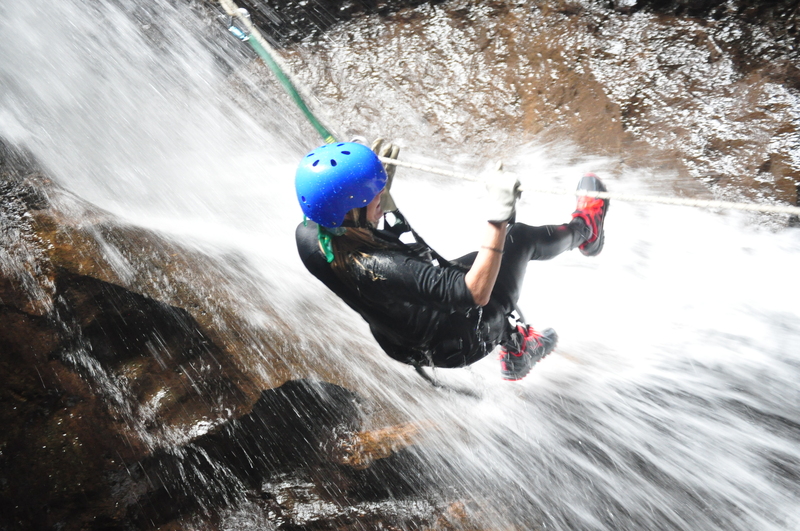 We walk down the river canyon over slippery rocks and repeat this process again as our guides swing us into waterfalls, make us jump from rocks into pools of water, drop us quickly from 20 feet above, send us ziplining to another platform and so on. It’s exhausting, cold and challenging but we make it to the bottom river bed and walk about half mile down a shallow river, where the water is warmer, and laugh and joke our way back to the finish where we are met with the best pineapple and watermelon I’ve ever eaten. It’s definitely a feeling of accomplishment and a relaxing moment knowing we have made it. As we are about to leave, we get the bonus of seeing a family of howler monkeys in the tree above. Nice touch to the end of another challenge met. 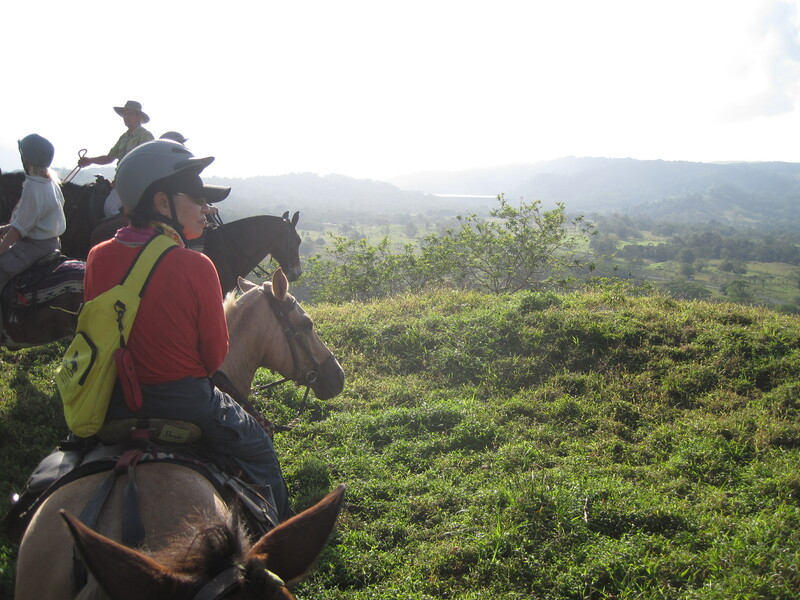 We dry off, hop in the car and head to the base of the volcano where our horses have been trucked to meet us. The guys from Leaves and Lizards have brought us homemade pizza (so good!) and we hop on our horses and head straight up the mountainside. I’m apprehensive about anything steep but I try to calm myself, sit back in the saddle and enjoy the day with Suzy. She is showing me she is the perfect horse for me – starts slow, warms up to a little more liveliness but not more than I can handle and overrules me when she knows the best path to take. I’m really at a loss for words in describing this ride. The weather is perfect and we are assured by the locals that a beautiful day like this with a full view of the volcano, no rain, about 70 degrees is truly unusual. We climb up a mountainside to a plateau that feels like you could touch the volcano. 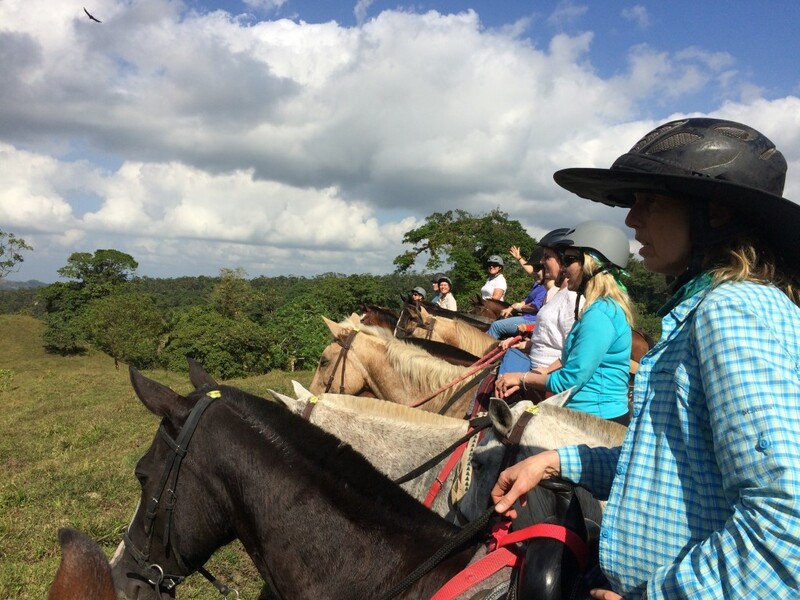 We stop for a group photo and a few of the experienced riders feel the energy of the moment and jump up and stand on their saddles. What balance! And what joy in their faces! (see pic). We continue on and our guide, Enrique who is so knowledgeable and supportive, gives us the most incredible tour to mountain vistas where we could see for miles, down to a green moss covered lake where he explains this area was previously the old road before the volcano erupted in 1968 killing around 80 people. He tells us about some of extremely large trees (the Cieba tree is huge; the tallest one is CR is 80m high! ), plants, flowers, local history and each view we ride to seems more amazing than the next. 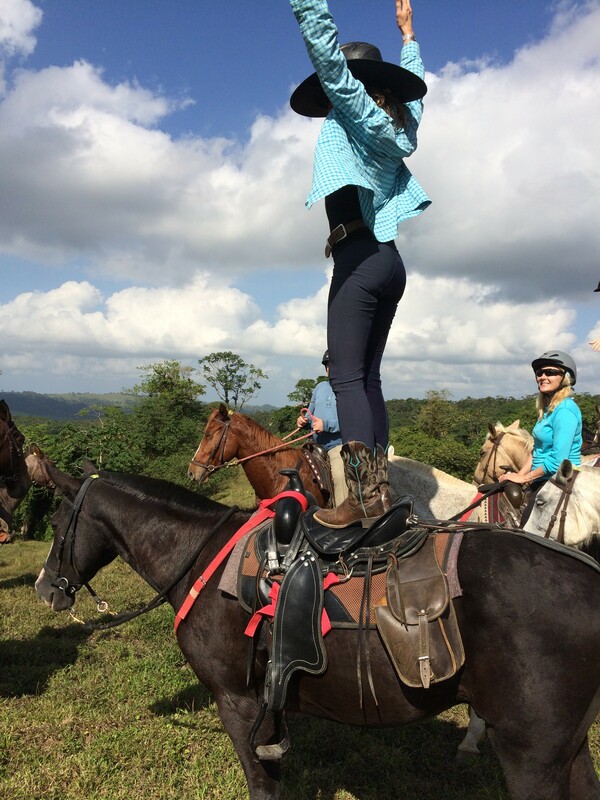 We finally make it to the pinnacle of the mountain and we all just sit on our horses staring at the view. It’s definitely one of the best views I’ve ever seen. 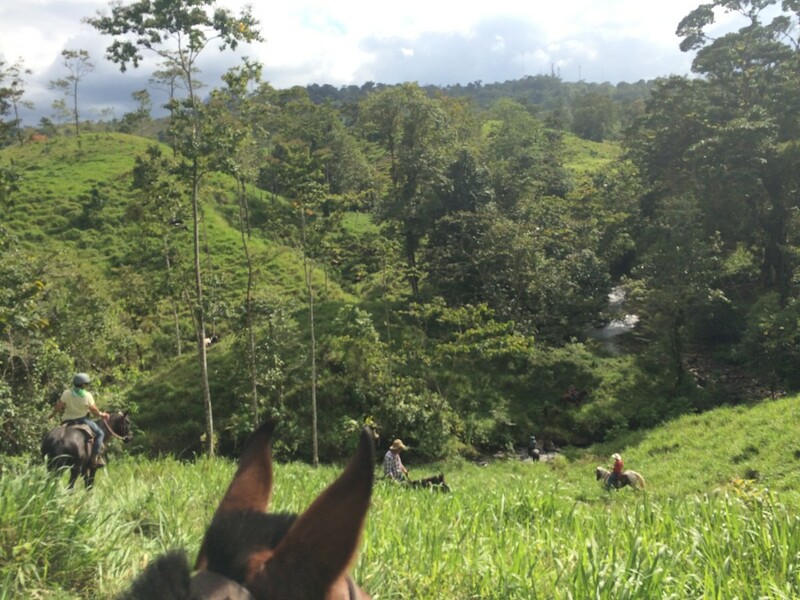 We continue on and when we get to the bottom of a valley and we have a straight path back up to the top and we all given a chance to canter our horses to the top if we want to try it. The experienced riders jump at the chance. It looks so exhilarating and I have trotted a couple of times with Suzy so I decide to go for it. I’m side by side with one of our instructors, Sally, and she takes off and calls Suzy to go and in Suzy style, she trots a bit then kicks it into a canter and I hold on for dear life to the saddle horn. That was so cool! Actually the canter is smoother than the trot so it felt good on my sore bottom that has been riding for hours on this trip – I assume this gets better over time with more riding? 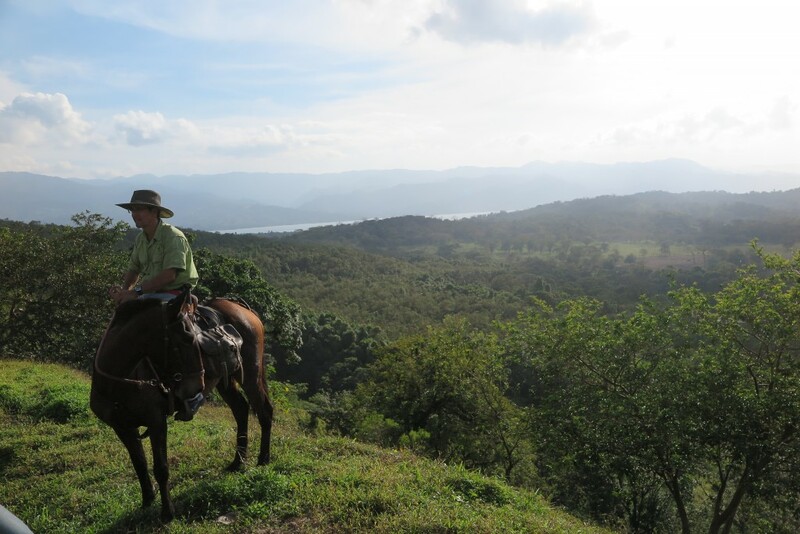 The day is coming to a close and we ride back down to mountain, load up the horses and head home for a delicious dinner together. We share photos and relive the day’s events. We’ve become our own herd. It’s interesting how you can bond so closely with 16 strangers over the course of a week when you share your feelings, challenges, triumphs and support for each other. The one thing I can say about this day is that on a horse in the remote countryside, you can see things you would never be able to see any other way. I’m thankful for the many gifts the horses are giving us this week – support, life lessons and unparalleled views from what feels like the top of the world. Michelle, Thank you for this beautiful recount of our experience together! Brings happy memories and tears to my eyes!